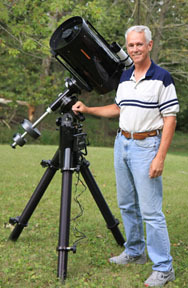 We also offer knobs for no-tools setup of Losmandy, Celestron, and TeleVue tripods. Check our mounts section for details. Try our custom knobs, where you can choose from a wide selection of screw sizes and knob styles for all your telescope thumbscrew and hand bolt needs. Here’s how to order Bob’s Knobs. Our product brochures and installation instructions are available for download. Our FAQ and technical papers are loaded with tips and tricks. Don’t see what you need? Contact us using the link at the bottom of this page.